Sleep centers use what’s known as polysomnogram to make a continuous record of your sleep. About two dozen small, thin electrodes and other sensors are pasted on specific body sites to take readings during the night. If your doctor thinks you have a sleep disorder, he will send you to a sleep center for sleep investigations. 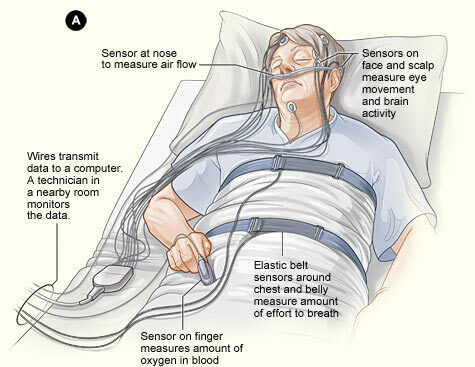 The most common investigation in a sleep laboratory is polysomnography (PSG). to investigate the differences between normal and abnormal sleep. an electrocardiogram (ECG) - monitors the heart rate and rhythm. 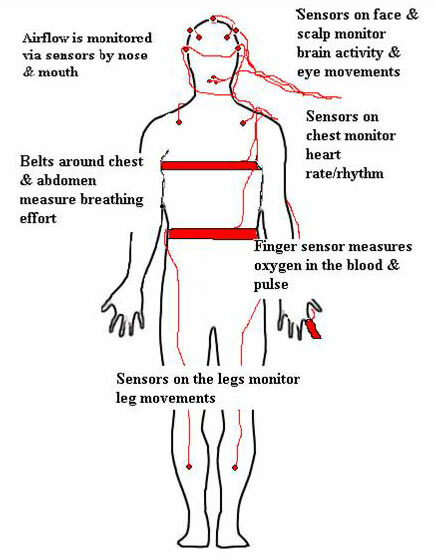 body movement detector - the patient will have a couple of electrodes placed on the muscles of the shins, together with a body position sensor around the waist. During your sleep study, you will also have other equipments which collects signals related to breathing, and records the airflow through the nose and mouth, your oxygen and carbon dioxide levels, and how big is your effort to breathe. How the Polysomnogram collects the information from my sleep? The information are collected on a single file that can be analyzed as they're recorded and later on. The procedure where the sleep technicians mount the wires on your body is not painful. However, the process sometimes exceed a half-hour time and can be really annoying for some patients. Is the Polysomnogram Test Painful? How the Polysomnogram Result is Interpreted? There are a lot of technical information to know to be able to interpret the polysomnogram results, and this is the reason why a sleep study is done by professionals. When your sleep doctor is reading your sleep results, he is looking for sleep fragmentation, which is the most evident sign you have a sleep disorder. Sleep fragmentation (arousals), is one of the most important side effect of sleep apnea disorder. When EEG shows waking activities for 3 to 14 seconds, then is considered the patient has an arousal. According to the American Academy of Sleep Medicine (AASM), the patient must be asleep for at least 10 continuous seconds before an arousal can be scored. Also, a minimum of 10 continuous seconds of intervening sleep is needed to score a second arousal. If the arousal index, or the number of arousals per hour of sleep, is above 10, then the sleep of the patient can be considered abnormal. 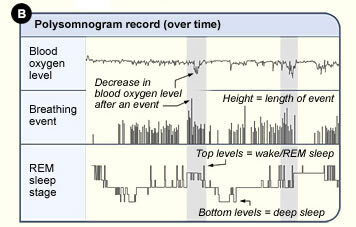 As you can see from the upper example, the terms used to describe the sleep study results are difficult to understand. RDI Index - means the Respiratory disturbance index . Apneas - is when you stop of breathing for a specified length of time or longer. Hypopneas - represents reduced breathing due to partial obstruction of the airway for a specified length of time or longer. AI Apnea Index - represents the average number of apneas per hour you had during the night. HI Hypopneas Index - is the average number of hypopneas per hour you had during the night. Arousal (Ar) - represents any sudden change on Electroencephalographm EEG from a deeper sleep stage to a lighter sleep stage. It may be related to an apnea, a hypopnea, a leg movement, or it may just be labeled "spontaneous" meaning there was nothing that it was clearly related to. Awakening (Aw) - represents a sudden EEG change from any sleep stage all the way to wakefulness. Index Arousal/Awakening Index (Ar/Aw) - is the number of arousals and awakenings divided by the total sleep time. For example, if this index is 53, it means that you were arousing or awakening (going from a deeper sleep state to a lighter one or all the way to WAKE) about 53 times an hour on average. Most of these arousals are caused by your apneas and hypopneas. Min SpO2 or Low SpO2 - is the minimum oxygen saturation. If the number is less than 90% then there is a concern. REM sleep - also called Rapid Eye Movement sleep, is when the most vivid dreaming occurs. NREM (non-REM) sleep - consists of Stage 1 (transitional sleep), Stage 2 (light sleep), and Stage 3 and 4 (slow wave). Most people have higher AHI numbers in REM than non-REM, but not everybody does. Central apnea - is when you are not breathing for at least 10 seconds and there is no effort to breathe for at least 10 seconds. In other words, there's no air flowing into the lungs and the belts around your chest and abdomen measure no effort to breath. Thus the upper airway is not necessarily blocked in a central apnea. The problem is your brain forgot to send the signal to your diaphragm to "breathe"
Mixed apnea - represents an apnea that has characteristics of both central and obstructive apneas. The episode starts similar with central apnea (no effort to breathe), but at some point the belts start to measure an effort to breath, but there's still no air going into your lungs. This indicates that the airway is blocked by the time your body is trying to inhale. Obstructive - is when you are trying to breathe (there is effort to breathe as measured by the belts), but the air flow into your lungs has dropped to zero at least 10 seconds. In other words, you've stopped getting air into your lungs because your upper airway has collapsed and is blocked, but your diaphragm continues to try to inhale air through the now blocked upper airway. Obstructive hypopnea - is when you are trying to breathe (there is effort to breathe as measured by the belts) but the air flow is significantly lower than it should be for at least 10 seconds. The diminished air flow with the continued breathing effort is caused by a partial collapse of your upper airway. It's often described as like trying to breathe through a very small straw. Mean - represents the (Sum of all the data values)/(number of data values in the set). PLMD Periodic Limb Movement Disorder - periodic episodes of repetitive and highly stereotyped limb movements occuring during sleep. The movements are often associated with a partial arousal or awakening; however, the patient is usually unaware of the limb movements or frequent sleep disruption.